In July I received an order for a bullwhip inspired by Old Glory. I finally got to make the whip last weekend and here is the result. 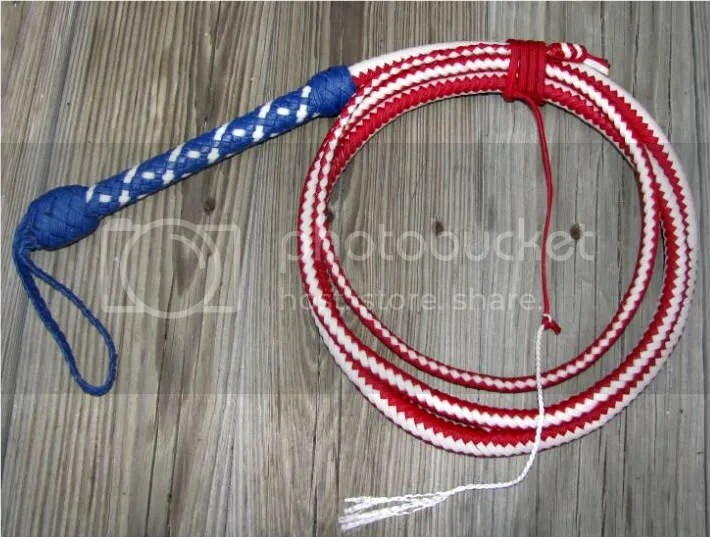 I wish I could claim to be the first nylon plaiter to make a nylon bullwhip to resemble the U.S. flag, but as far as I know, that honor goes to Ron Allen. It was earlier this year when I met Ron and saw one he had made. I thought it was the coolest nylon whip ever. This whip is 8ft long and built in the traditional American style with a short, 8″ handle (Australian style bullwhips have 12″ handles). The heel knot is a 7 part, 6 bight turkshead and a the transition knot is 5 part, 4 bight knot. I hardly ever build whips for myself, but this is definitely one of those whips I will hate to ship out. This entry was posted on Monday, November 30th, 2009 at 8:08 pm	and posted in bullwhips, nylon whips. You can follow any responses to this entry through the RSS 2.0 feed. I’m sorry, but at this time I am not taking new orders. I hope to start after New Year’s Day.